This week, myself, Meridith, and a guest author, will be sharing our stories of coming to careers in STEM fields. We hope we can offer three different perspectives on finding your career path, navigating higher education, and deciding how and when your journey needs to change. We’d love to hear any and all of your stories about finding your calling or your struggles/victories if you’re still trying to figure it out right now. Please share! It’s important for all of us (especially those in high school and undergrad) to know that there is no single, best way to approach this crazy adventure. When applying for my PhD program, my soon-to-be mentor offered up some solid advice about writing and entrance essay to an ecology graduate program, “For the love of God, don’t tell us how you were a little kid with a bucket on the beach.” Good advice for standing out in the pile of 100 essays written by little kids playing in the sand who grew up to become would-be scientists playing the sand. I am, now, going to completely disregard that advice. Here, making our point this week, I think it’s important. 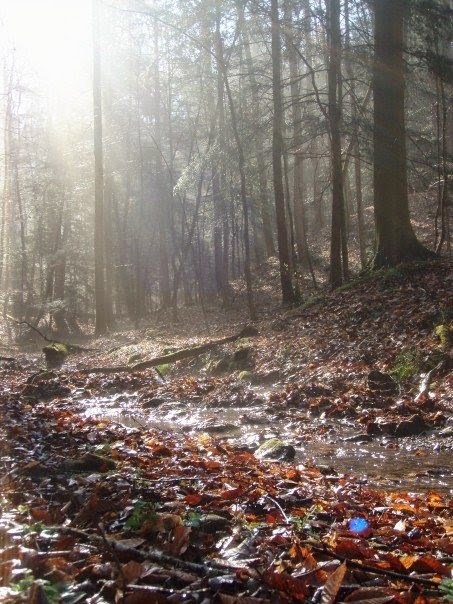 I was introduced to the natural world, bare feet first, on my family farm in rural Kentucky. My parents are both trained scientists, a plant pathologist and a horticulturist. However, when I was young, my father worked as a control room operator in a factory and mother ran our family farm. We grew tobacco and various crops for sale and subsistence. 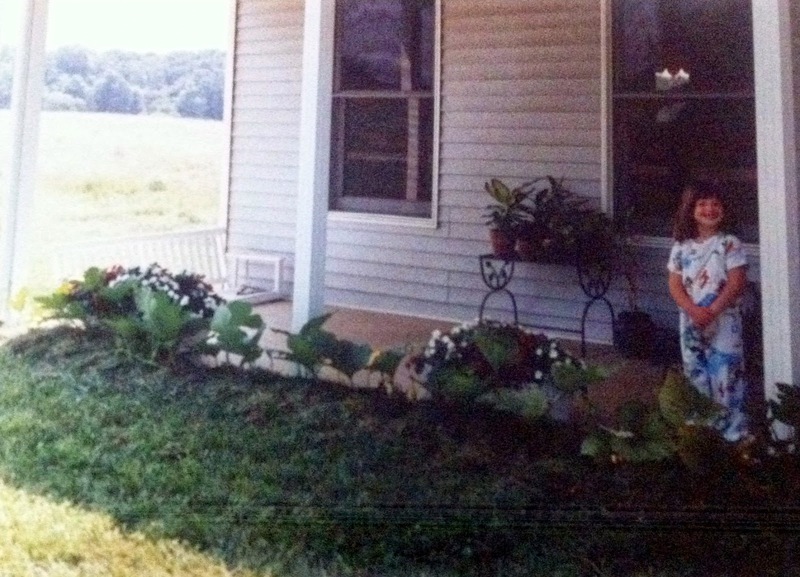 I grew up working our fields, learning about photosynthesis from pea plants, and cataloguing crayfish in the aquarium (or five) my parents let me keep on the front porch. I poked, I planted, and I was taught the names of trees before I knew the names of all the states. My first celebrity crush was Jeff Corwin. My brother has a degree in Aquatic Biology and my sister is working on her MS in Ecology and Ecosystem Sciences. To say we never had a chance to be anything other than science nerds is, likely, the understatement of the year. Evidence 1: I planted that watermelon. I was over the moon when it started to grow. I think this image says a lot. Despite the fact that I told people I wanted to be a field biologist when I was 10, I lost sight of that ideal during high school. Career tests don’t usually turn up “ecologist” as an option. Lucky for me, in the spring of my freshman year, the second half of the intro bio series for majors focused on biodiversity, conservation, and ecology. And, here was a person instructing the course who seemed to be making his career out of asking questions about the way nature worked! I’ve been exceedingly lucky to have amazing mentors in my life, and Dr. Mike Stokes was the first. Before the semester was out, he had helped me secure a position working in the Aquatic Ecology Lab with Dr. Scott Grubbs. 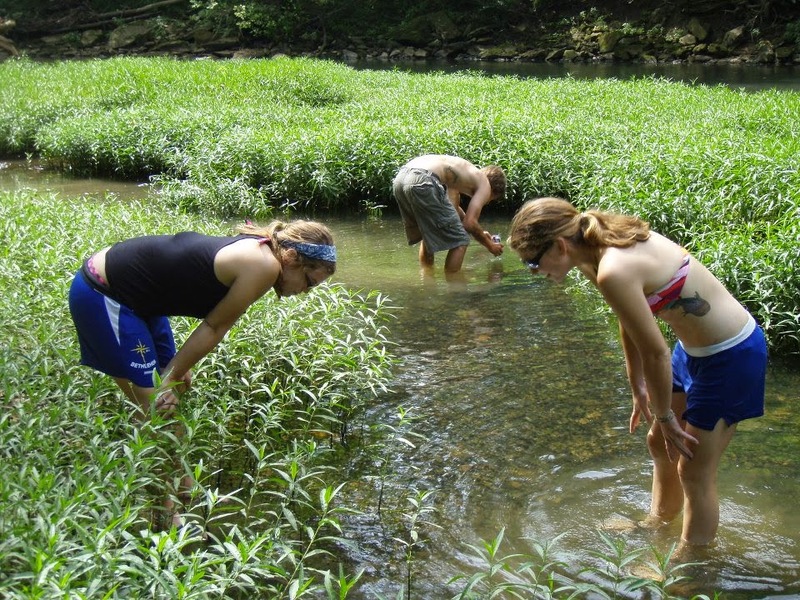 I spent the summer in streams and rivers all over western Kentucky. I stopped thinking about Jeff Corwin and started day dreaming about Raymond Lindeman and EO Wilson. Evidence 2: The adult Wigginton siblings, turning over rocks. This was also the summer when Meridith decided to be my best friend. I mention this because I’m super duper shy, and the way I remember the start of our relationship goes something like this: Mer – “Can I come over to your house and watch a movie?” Rach – “Sure, if you don’t have anything you’d rather do.” *proceed to drink leftover keg beer out of milk cartons and sing Moulin Rouge songs* (Editor’s note: Rachel’s the cutest if she thought I wasn’t going to add THE picture of this night. See below.) I don’t just bring this up to talk about how adorable we are (though, obvi), but because having another young, female friend who was very serious about becoming a research scientist was fundamental to my success. Meridith has always inspired me. And, she introduced me to her, and soon to be my, undergraduate mentor, Dr. Albert Meier. I told Albert about myself and my interests, and he told me I should get a PhD. Fast forward four years, and I had written an honor’s thesis, which was difficult, done research in several countries, which was a blast, and applied for lots of fancy scholarships to get my graduate degree overseas. I don’t get any of them. I was pretty disappointed, so taking a year off from school seemed like the best plan. Unfortunately, it was 2008, and around January 2009 I realize that trying to find a job right then was going to be the literal worst. When people ask how I ended up studying tidal marshes in California, I usually say that I wanted to translate my aquatic research experience to a marine environment, and I wanted to move to California. That’s true. There were also very few graduate programs still accepting applications when I decided “Oh yeah, I should do that.” I have never been luckier than when I emailed Dr. Christine Whitcraft and asked if she had a place for a Master’s Student that fall. What seemed like a very short amount of time later, I was moving all my belongings over 2,000 miles away from the place I had spent my entire life. But I loved it. My MS experience was challenging, there were absolutly times I hated it, but I mostly remember having so much fun! Having a young, female mentor and a lab full of aspiring (almost entirely) female ecologists was so inspiring. 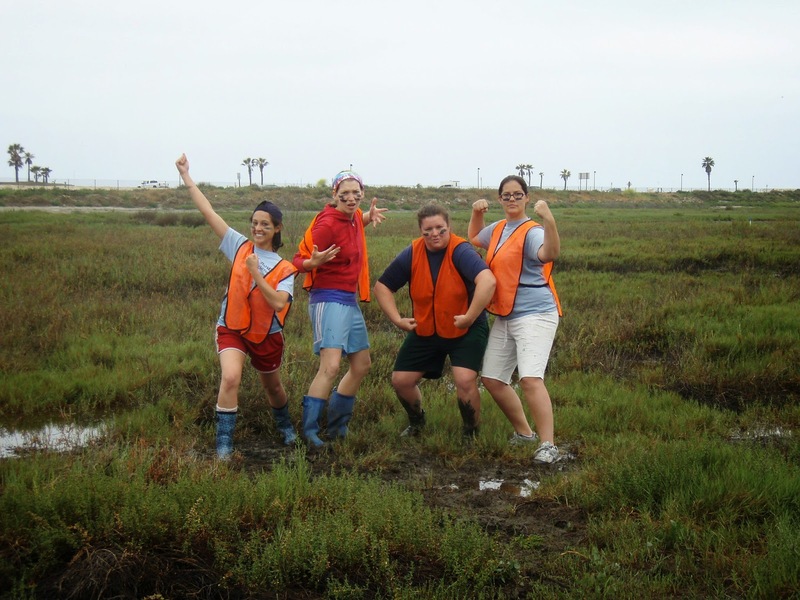 Evidence 3: The women of the Wetland Ecology Lab. Class, class, class. For me, getting my MS ended up as a way to get more experience so that I could go into my PhD program prepared. I think I really lucked out that I ran out of time to apply for PhD positions in 2009; I don’t think I would have made it if I’d even been accepted. But, post-MS, I felt prepared and excited. Choosing a PhD program was difficult and simple all at the same time. UC Davis was my top choice because it kept my partner and I in California and the program seem to suit my personality and career goals. I cast a wide net, but ended up moving up the California coast to start my PhD right after finishing my MS. Which leads me to…here, where I am now. I’ve been in school from the time I turned 5, I’ve always known what I wanted to be, and when I was 19, someone finally put a name to that ideal. Ecologist. Of the three stories you will read this week, mine is probably the most boring. I wanted to be an ecologist, someone told me I should get a PhD in ecology to be and ecologist, and now I’m doing that. I won’t say there haven’t been times when I thought about quitting (my first field season for my PhD was very, very rough) or instances where I’ve let my personal life and relationships lead my career decisions (there is a long list of schools I didn’t even apply to because the locations didn’t work my partner). However, I’ve always had a very strong idea of what my goal was. Recently, I’ve come to realize that my degree goal isn’t actually an endgame. There are so many ways to “be an ecologist,” and I’m currently giving a lot of thought to how, where, and why, I want to practice my science. I’m excited for my very linear life trajectory to get a little more twisty in the years to come. Exactly how I remember my first year of getting paid to do ecology. 2006.